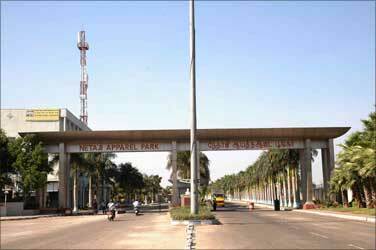 The Netaji Apparel park, which houses textile factories is 10 kilometres away from Tirupur. The road to New Tirupur (as it is called) is quite isolated. As we drove from old Tirupur to New Tirupur, we saw many young men walking on the road all smudged with gulal (colour powder), playing holi and enjoying themselves. One wondered, Holi in a small Tamil Nadu town? We talked to the group of men who were making merry. All of them had left their home in search of work, money and better opportunities. Most of them, had not even heard Tamil or about Tamil Nadu till they reached Tirupur. Today, they speak Tamil in a place where majority of the people do not understand Hindi. Tirupur has changed their lives, offering them regular work, money and a better quality of life. Satya from Jharkhand has been in Tirupur for the last ten months. So what brought him here? The entire gang shouted, "Money... money. All of us left our homes as we were in dire need of money." Image: Netaji Apparel park, Tirupur. Jeetu and 20 others came from Ranchi to Tirupur three years ago because there was no work on his farm, and there was no money at home. "We have a farm there but the harvest has been very bad for the last few years. We needed money. That is when a friend of mine told me about Tamil Nadu. I had not heard of this place earlier. My friend was earlier working in Gujarat. He said Tirupur has many textile companies. So, along with my friend, 20 of us came to Tirupur." It has been three years now. The fear of going to an alien land without even knowing the language has vanished. All of them have become a part of Tirupur now. They have not visited their villages in the last three years. "We like the place and the work. So we are here even after three years. We get enough money to eat good food, buy clothes and save for our families. We decided not to go home in these three years as we did not want to waste money on travelling. We are happy here. What will we do if we go home? There is no farming there. On the other hand, we make Rs 200-250 a day throughout the year, which is unthinkable in our place. We have been able to send home at least Rs 4000 a month, so our families are happy. Our folks tell us not to come back." Salman from Orissa is also a farmer but had to leave his home town as there was no farming there. He came to know about Tirupur from his friend. Initially, he had problems with food and language but now he is happy. "Here we make more money if we work extra time and in shifts. I work hard and send at least Rs 4000 home every month. For the first time, I have a savings account and an ATM card," he proudly said. Among the happy lot, Kumar from Andhra Pradesh says, "This is the only place where you will get work every day. In Kadappa, we are lucky if we get some work at least 10 days a month. Here, I make Rs 4000-5000 every month. During the rainy season in my village, I go back to work in my fields. When there is no work there, I am back in Tirupur. I spend six months here and six months in my village." Hussain's story is quite unusual. We have heard of people from all over India going to Mumbai in search of jobs and fulfilling their dreams but here is a young man who found Mumbai a difficult place to live in. Along with a friend, the 25-year-old Hussain moved to Tirupur 12 years ago and is happy that he took that decision. "My parents, brother and sister live a decent life as I am able to support them. On good days, we make Rs 300-400 a day. Seeing the way my family live, 30 to 40 young men from my village have come here. Nobody from our village goes to Mumbai these days. You have to pay a high deposit to live in a very small hut and everything is so expensive. On the other hand, in Tirupur, we get to live in a better place and food is cheaper. Now, I also speak Tamil very well. I feel as if I belong to Tirupur. Of course, there is nothing better than your own gaon (village) but then due to circumstances, we had to move out." Like Hussain, Anwar Khan also went to Mumbai from Uttar Pradesh as there was no work in his village. "It was impossible for me to raise my four children. I went to Mumbai but I did not get any good work. Everything was so expensive there so I couldn't send any money home. When I went back to my village, some of my villagers who work here told me about Tirupur. I have been here for the last two years. Now I save up to Rs 5000-6000, send home around Rs 3000." While many young men migrated to Tirupur from the northern part of India, there are more women from southern parts of India like Kerala and Karnataka. Suvarna from Kannur in Kerala came to know about the job interview from a newspaper advertisement. There was no job for her in Kannur though she had a diploma in fashion technology. Sarah and her husband came all the way from Pathanamthitta in Kerala to work in Tirupur. Despite being fashion technology diploma holders, they could not find good jobs. What is it about Tirupur that attract so many young men from such far away places like Uttar Pradesh, Bihar, Jharkhand and Orissa? Image: Girls from Kerala, Karnataka and AP at work. 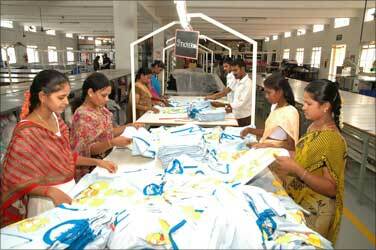 The garment-making industry, which is the mainstay of Tirupur, is very labour intensive. It takes ten people to make a garment. Tirupur needs 11 lakh people to work in the textile field. But there is an acute shortage of 40-45 per cent or 5 lakh people. Rajan of Rajsujee International says he has a labour shortage of 30 per cent. About 30 per cent of his work force is from north India. About 30 per cent of the workforce in CBC Fashions owned by Vijayakumar is from Bihar and Orissa. In the next 6 months, he says, this would rise to 50 per cent. Pointing to his half empty factory and machines, Vijayakumar said, "these machines are vacant because I don't get workers." Vijayakumar says twenty years ago, workers used to come and stand in front of the factories every morning asking for work. Today, factories send their vehicles to the nearby villages so that workers can come to work. "There were only 500-600 factories then but today, there are more than 5000 factories. Exports which stood at Rs 3000 crore (Rs 30 billion) to Rs 4000 crore (Rs 40 billion) has gone up to Rs 11,000 crore (Rs 110 billion). So, we need 11 lakh people to work in Tirupur. Today, we are importing workers from UP, Bihar and Orissa. We provide hostel facilities for girls from Kerala and Karnataka. We also have a person to arrange housing for the people. It is necessary to build houses for them so that it is an added attraction to the workers to come and work." 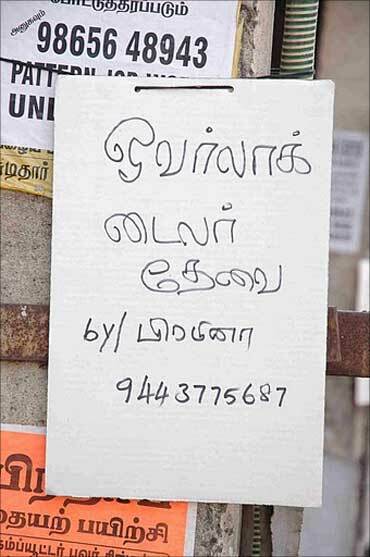 Dhandapani of Sreenidhi Apparael Pvt Ltd offers accommodation to the migrant labourers so that they don't move to another company. These workers switch jobs for a small raise as most of them pay wages as per the shifts. His company buses go to the nearby villages and bring people to the factories. 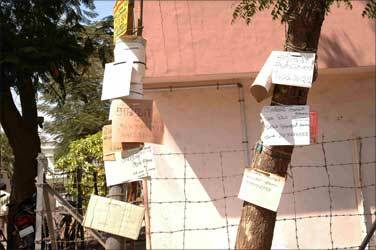 One thing you can't miss when you go around Tirupur is the number of posters on tree trunks, electric posts and walls - all calling for workers! Perhaps, after sometime, they may start pasting such posters in the villages of Bihar, Jharkhand and Orissa too. Image: Advertisements calling for more workers. Jobs are back! Banks, IT, auto firms hiring!